Indy Furniture offer a full Design Service. 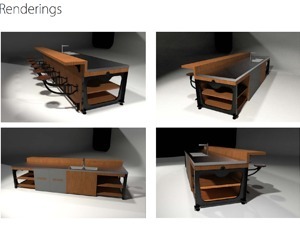 We can design and build bespoke furniture to suit any requirement, please get in touch for further details. 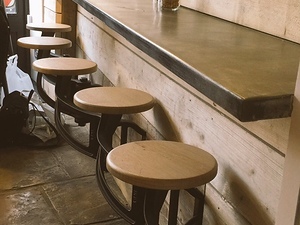 Indy Swing Arm Stool Tables Extra High in 'The Slaughterhouse" Guernsey. 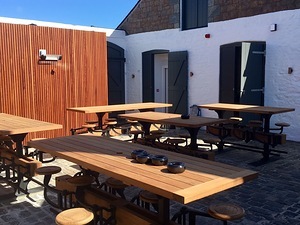 Our Indy Swing Arm Stool Tables are now installed at "The Slaughterhouse" in Saint Peter Port, Guernsey. These are located outside in the courtyard bar and the perfect solution for the uneven sloping cobbled surface. Indy Swing Arm Stool Tables available to order now! Our Swing Arm Stool Tables are fully customisable. We can now supply these tables with any number of stools attached, built to any length at dining table (30") and counter height (36"). Choose from a large range of timber, zinc or stone table tops, we can build to your specification. Indy Furniture classified advert appears in the Interiors issue of Bath Life followed by a feature in the Shopping issue. Indy Swing Arm Stools now in stock. 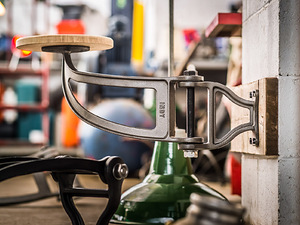 One of our flagship products the Indy Swing Arm Stool is here. 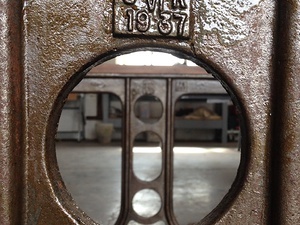 This classic industrial design is manufactured by Indy Furniture here in the UK using the best materials to produce quality castings. Made in England, Made for Ever. Different finishes. In stock. Available now. 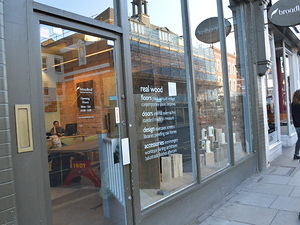 Indy Furniture now on display in Broadleaf Timber on Fulham Road, SW6. Very pleased to now have one of our Indy Custom Table and Bench sets on display in the Broadleaf Timber Shop at 715 Fulham Road, London, SW6 5UL. 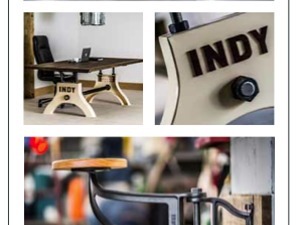 Indy Furniture can now be seen in London, so if you're looking for something unique and different get down to Fulham Road and be one of the first to see the exiting new furniture manufactured here in the UK, from the new Bath based furniture company. Whats been happening in the factory? Our Walnut and Glass Dining Table. 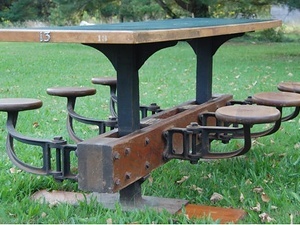 We found this pair of cast iron bases in the corner of a reclamation yard. They were originally produced to commemorate the coronation of King George VI and are dated 1937. Contact us for more information. 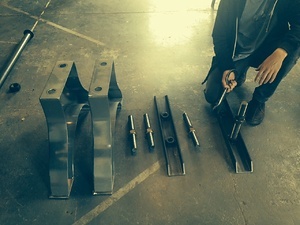 Meet today to discuss video content and style, looking forward to shooting our promo/assembly instruction video. Arriving soon, the latest product in our range. 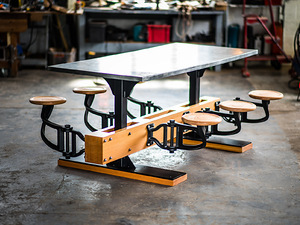 Create bespoke seating by combining our swing arm stools with any of our table tops, manufactured in our workshops to your specification.